We could have just bought another shower insert for a few hundred dollars but we felt like it would have been money wasted since we planned on tiling one day anyway. I got a bid from a contractor and the estimate was over $6000…really out of our budget!! You know I’m a DIYer but this project seemed even bigger than I was capable of doing…since it was on the second floor and leaking had originally been the problem. I started doing some research and found a company called Schluter. 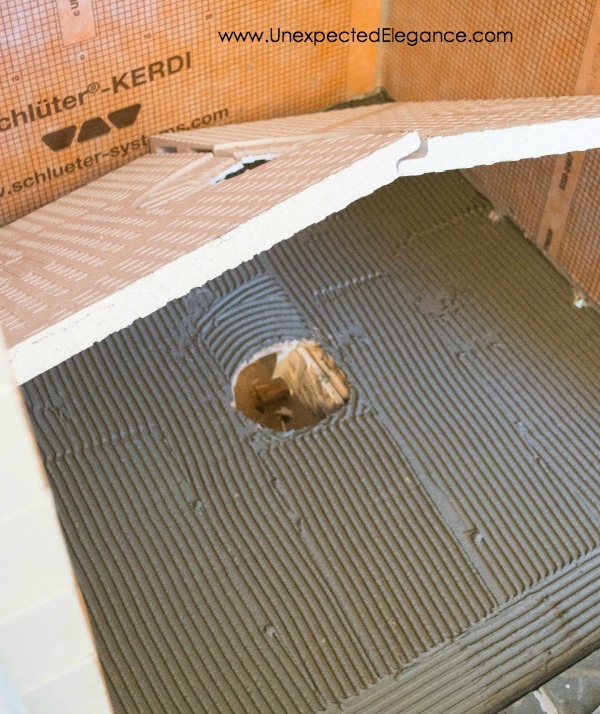 They sell a complete shower system, with a waterproofing membrane and a customizable floor. Needless to say, it is very affordable and gave me the peace of mind about a COMPLETELY waterproof, non-leaking shower! 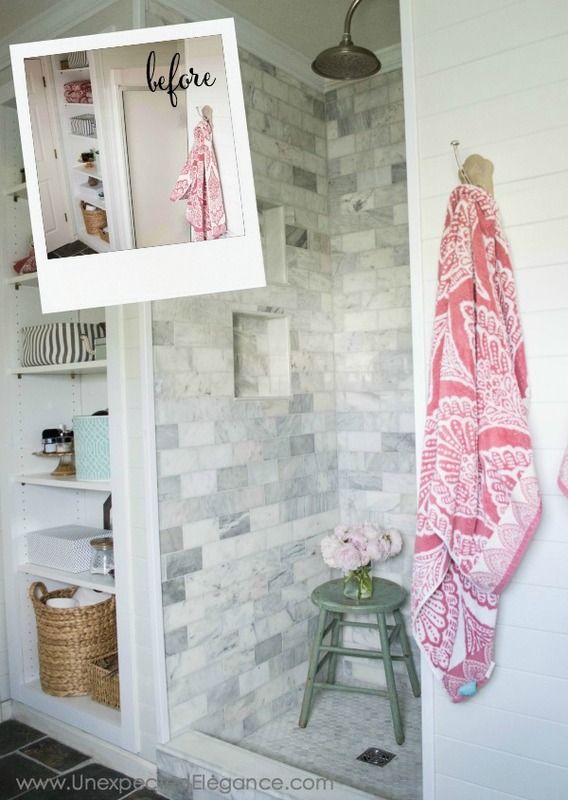 Also, be sure to check out my post: 4 INEXPENSIVE Tricks to Give Your Tiled Shower A Custom Look, if you’re starting your own shower renvovation! I found it at Home Depot but I think Lowe’s has started carrying it as well. 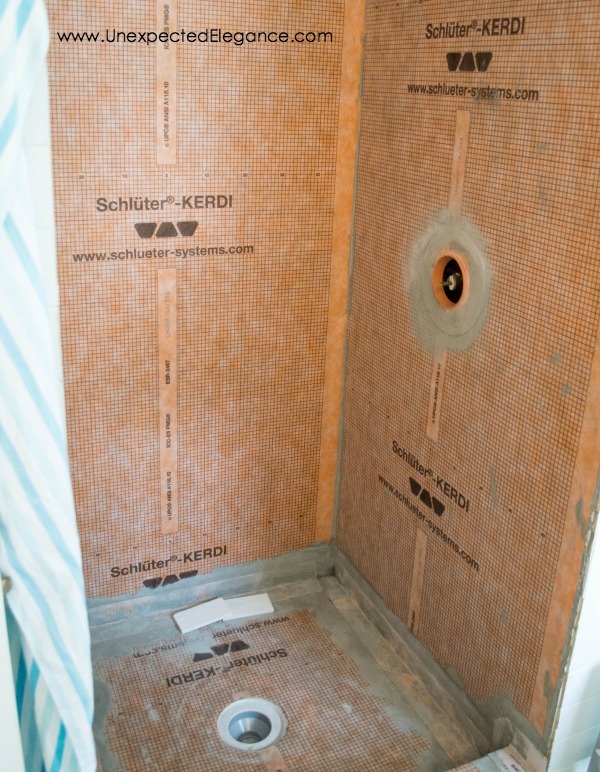 The complete Schluter Kerdi Shower system is around $500-$550 which included the waterproofing for the walls. 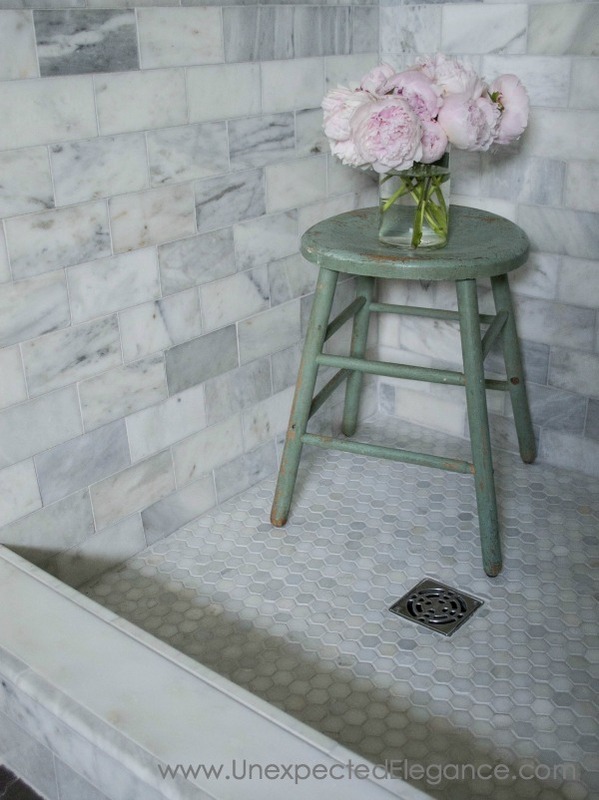 I had priced out fabricated molds that I could tile for the floor and nothing was even close to that price! 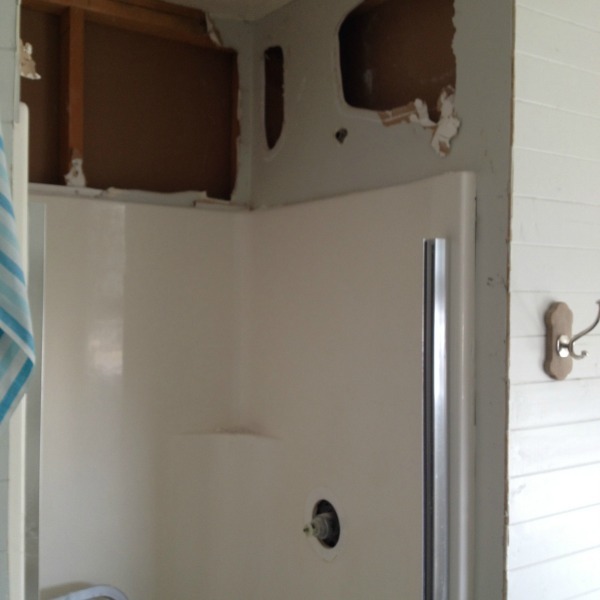 We started by removing the old shower insert and all of the drywall, taking it down to the studs. 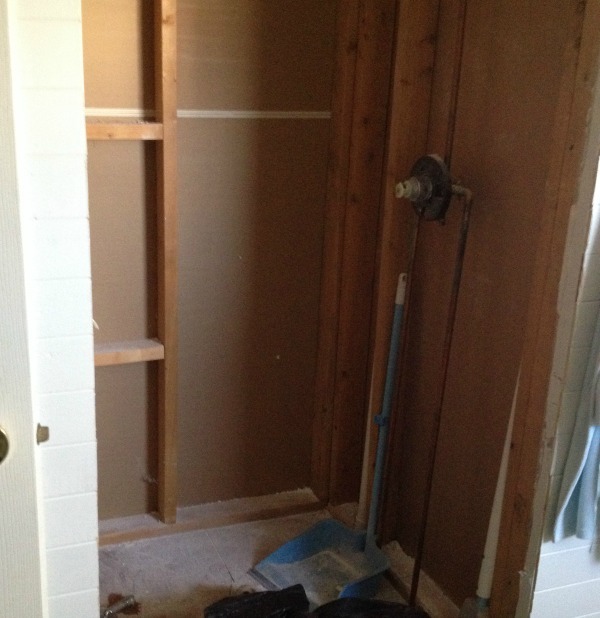 We hired a plumber to remove the old faucet and install a new one…plumbing is way out of my comfort zone! 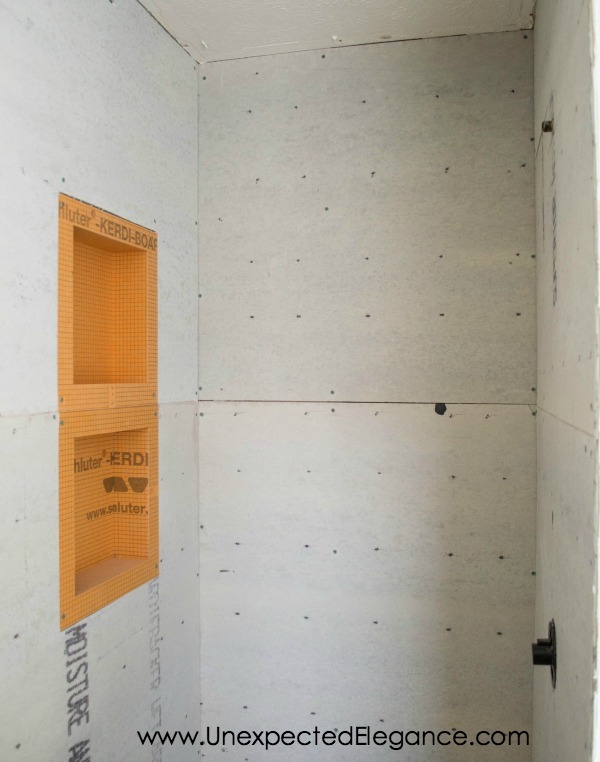 Then we put up a concrete backer board and installed two 12×12″ Kerdi niches. 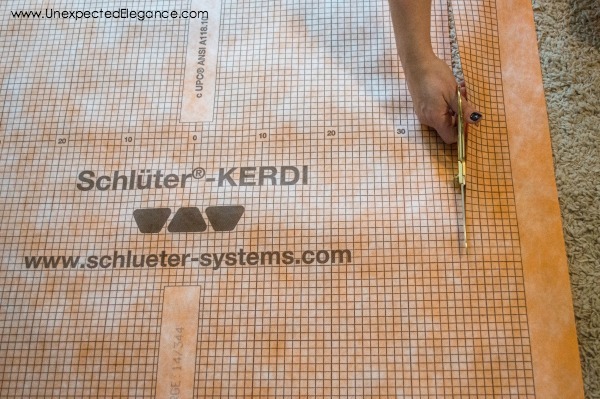 They also sell a Kerdi board that would have probably been so much easier to install, but I found out about it after we had already started with the cement board. The membrane is easily cut using scissors. 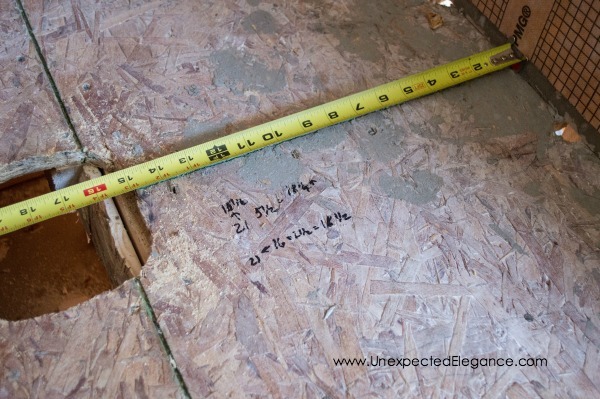 Measure the floor to find the center for the drain, so you can make your cuts for the shower tray. If your walls are not square (like mine) use a large square to figure out the difference. You can see from the next picture that my wall gradually gets bigger, so my shower tray was not a perfect square when we trimmed it. 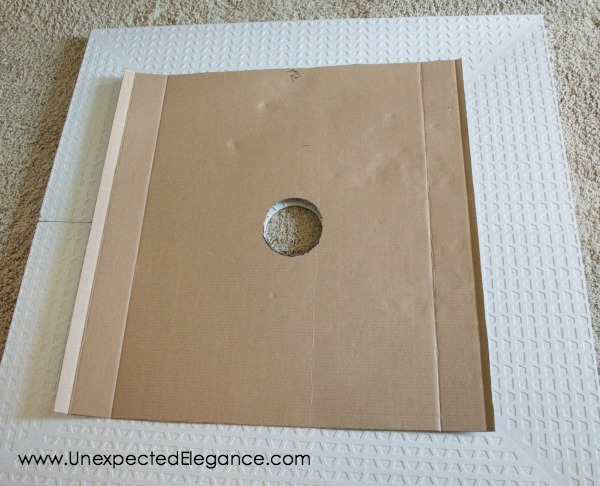 To make sure we cut the tray correctly, we made a template out of cardboard first and used it to cut the tray and membrane for the floor. 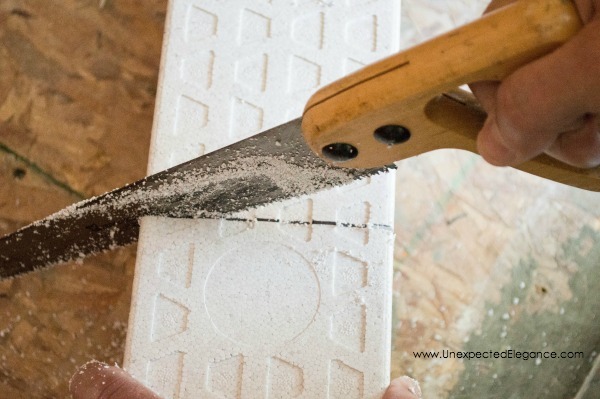 The tray and step are made of expanded polystyrene foam so it’s easily cut with a hand saw. I won’t lie, it was a challenge at first figuring out the mortar. If it’s your first time working with a trowel it takes some getting used to. After everything was waterproofed and set, we did a water test before we installed the tile. You can get a 2″ stopper from the plumbing section at most hardware stores. 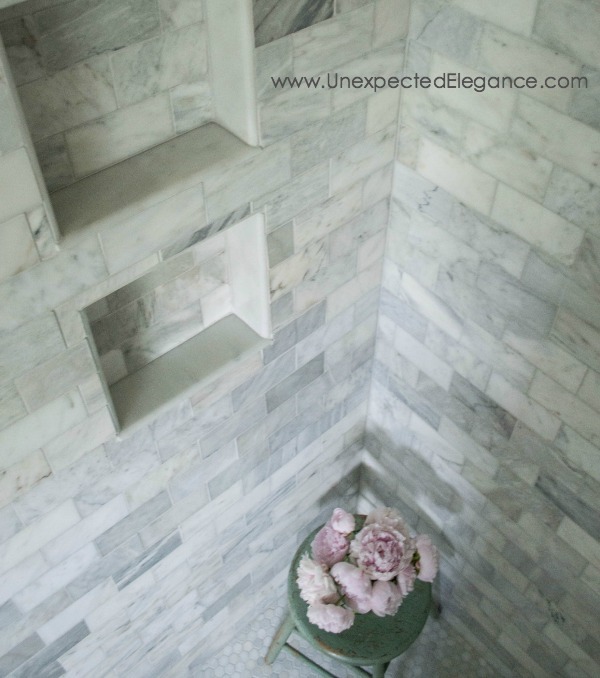 After many hours of tiling (because I choose such a small tile…it took 80 boxes), I absolutely love how it turned out! I’d love to help you on your next room design! Click on the button below to take my FREE 5 day challenge where I walk you through all the steps for creating your dream room. BE SURE TO WATCH THIS VIDEO BEFORE INSTALLING!! 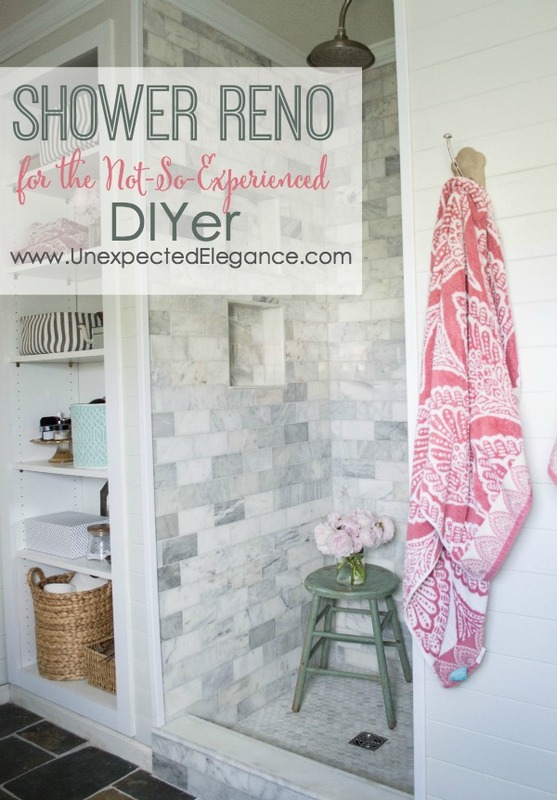 This post is so long but I still have more to share about the finishes, so go check out my 4 INEXPENSIVE Tricks to Give Your Tiled Shower A Custom Look! Thank you for this informational post! I might let my husband do the shower reno in our new house now. Looks like it would save a lot of money and it looks fantastic! Did you have any problems with the mortar? When he has tiled before, his mortar tends to crumble and chip. I don’t know what he does wrong. Hence my hesitation to let him tile…. That shower looks beautiful, Angela! I’m trying a project like that at my home, but I haven’t been very successful with plumbing. I think I’m going to hire a professional, so I can get the job done. You must be incredibly handy, if you can build a shower from scratch! Angela, great job on the shower. Could you please tell me what tile and manufacturer you used? I really like it, but can’t find one like it. Thank you. Just curious- I didn’t see anything in the post about a door. 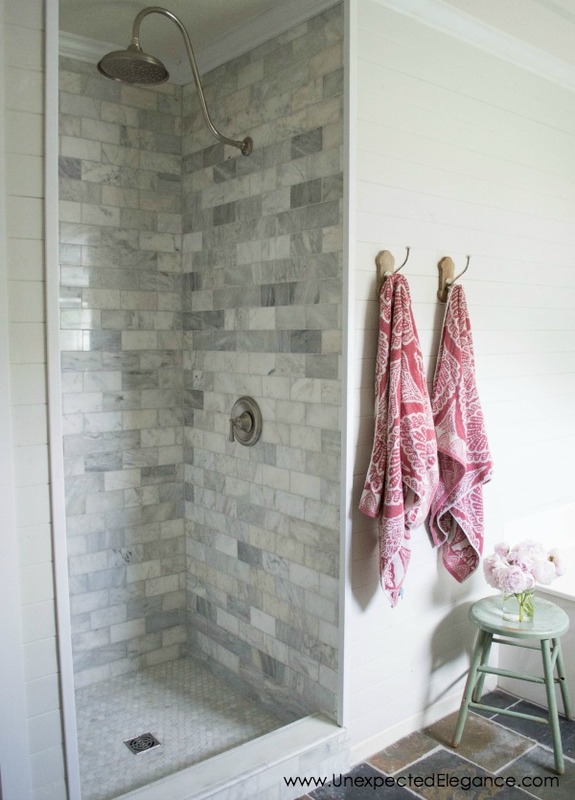 The shower is beautiful as is, but are you planning on putting in a door? Shower curtain? Or leave as is? Just curious how much the whole project ended up costing? Couldn’t find a way to comment on original post so I’m here. 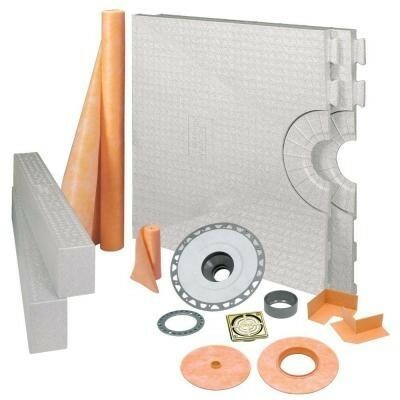 You could have further saved money by getting the schluter stuff from a tile shop. Lowe’s and Home Depot are not proper retailers and they buy from tile shops themselves then mark up. Also using concrete board behind kerdi is redundant. Regular drywall is just fine. Only other comment for others doing this is to waterproof floor first then walls. So the waterproofing overlaps the right way. OP is fine here with 1.5” overlaps but it’s just better practice the other way. Question on your tiling. Did you tile the walls first starting at the boots? And then do the floors? Also did you caulk the seam where the floor tile and wall tile meet up or did you fill with grout only. And you had exisiting bathroom floor since you ripped out the old shower much like I will have. Did you just out the curb against the existing floor and tile over it and grout that joint as well? Any tips on the tiling process would be awesome thank you. Gorgeous, I love it. 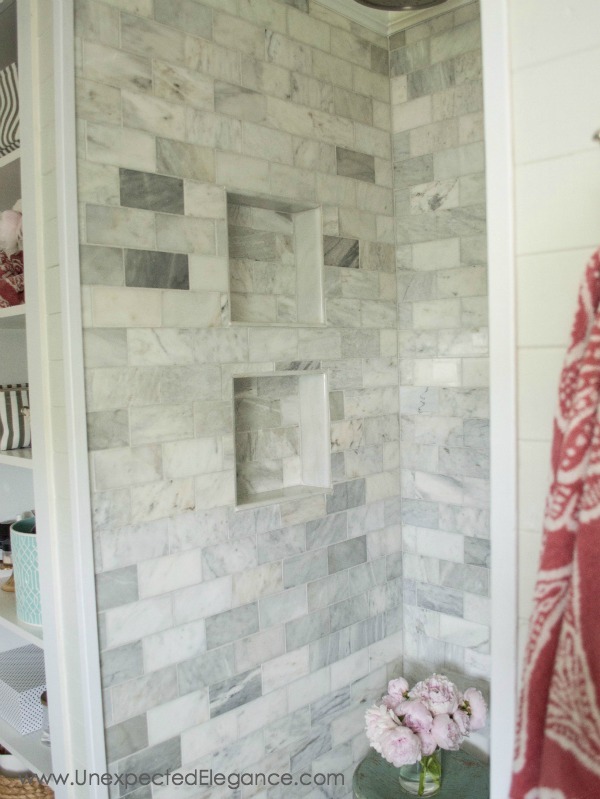 Is the tile on the walls marble? I love this and your blog! Your projects are so classy and beautiful! We are about to install a new shower into our garage. I’m headed to go check out this system right now. Looks gorgeous! How much did the whole project end up costing you? How much were those beautiful tiles? Thanks!! It ended up costing around $1700 all together. We still are using a shower curtain, so that price doesn’t include the shower curtain. I don’t remember exactly how much the tile was, but I think it was around $6 for a small box? I thought you said it cost around 900 ? This says 1700 $$. Pam, I’m not sure why I said $1700 on this comment (this was 2 years ago, so I can’t remember)? The waterproofing system was around $500 and the only other things we spent money on were the tile supplies, plumbing fixture, and plumber. I think that was around another $500? Thank you for this post. Your shower is beautiful. My husband and I are considering taking this project on as well. The estimates are rolling in at $2500 – $3000 for just labor for only 2 days of work. I want to make that kind of money! That would put our final shower project around $6000 (ours is an extensive remodel). What other sites did you use to research this process? Thanks again! I love your shower head. Can you share the make, model and price? Thanks! I am so impressed! You did an amazing job. We have had the same estimates you wrote about; I know so many people that have done their own showers that I was convinced there is another way. Thank you so much for sharing your experience. 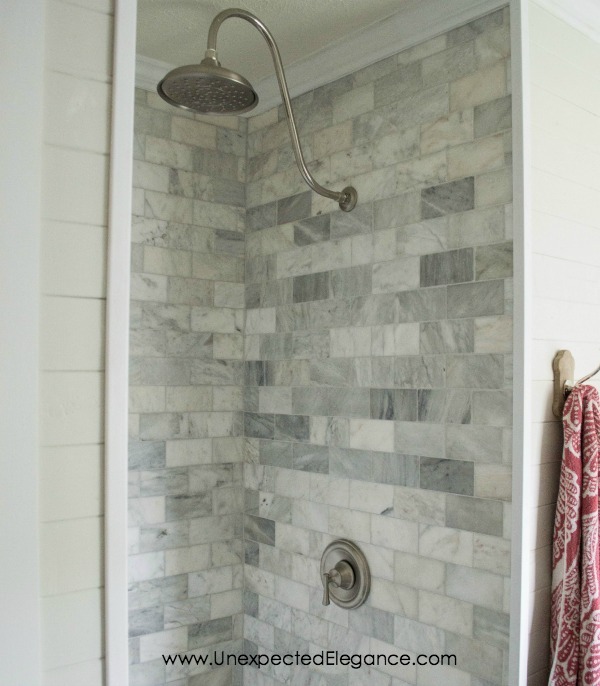 I’d love to rip out our prefab shower and do this. Your info has given me courage to look into doing it myself. I’ve always wanted a walkin shower with no curb. (Less work, I’m hoping, easy cleanup). Would that be harder? Heading to lowes to check out the schluter products. Thanks again. Wow this is seriously stunning. I’ve been trying to get a good shower and bathroom for myself but never really got it to be how i wanted it. This article will definitely help me. Thanks a lot! By the way i’d recommend you to take a look at shower filters, because i see you have amazing skin, so you should be careful with chlorinated water and other similar things because they can seriously damage your skin. I wish I could talk my husband in to committing to a project like this! Thanks, Teddi!! We love how it turned out. Beautiful!! Can you please tell me the dimensions on this masterpiece??? I need to fit in a small shower so I am taking all kinds of notes on this one. Thank you!! It is about 34″ wide and 38″ deep. Hope that helps!! I am so impressed. We are having the same problem. I tried to talk my husband into doing it ourselves but no luck. And the quote to have it done professionally was $5000!!! With one kid in college and another to go that’s waaay out of my budget. I am totally going to check into this. Thank you so much for sharing!!!! I just have a question when you were installing the schluter base you said to measure to find the center for the drain. Wasn’t the drain already there from your previous shower? I might be confusing myself but I really want to do this to our shower we have a prefab insert like you did, but I do not want to be moving plumbing around for it. Did you/? Sorry about the confusion! We did not move any plumbing. 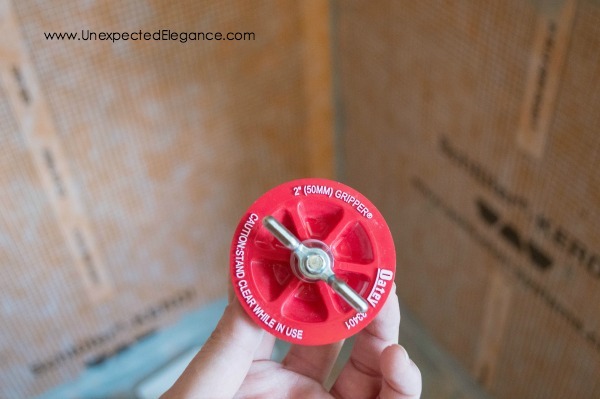 Measuring the drain is just for when you are cutting the foam for the base of the shower. 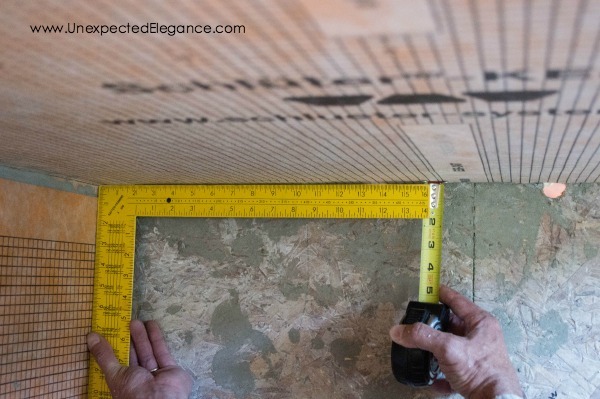 You will need the measurement from the center of the drain to the wall, so that your form will fit properly. Hope that helps!! Very nice. I like how you detailed each step. I was wondering if the system call for sealing the seams? Did you install a glass shower door? From experience it’s important that you are working with plumbed walls and level sill. What would you differently? Beautiful!! And we are seriously thinking the same project. My question is, where was the old shower leaking from & how did you determine that?? I think we have a leak too but I don’t know if it’s our master bath or guest bath. Hoping there’s an easy discovery process. We don’t have access panels for our plumbing. Your system is quite creative and effective, based on the results you show, thanks for sharing it! I’m a professional in this field, and I have to tell you that the quality of your work is outstanding. Your shower looks excellent and professional, congrats! Thanks so much for this post – your situation looks like ours only we haven’t experienced the leak so far ;). So happy to hear about this product and your experience with it. Looks terrific! I absolutely love the tile I read you purchased it from Lowes do you have the name of it? I want to tear out my shower/tub combo and put in an overhead rainfall style shower with no door just a half wall and all tile. Does the same system you use work for larger projects? Yes, you can make it as large as you want! That’s is what I was wondering.. I have read the article and all the questions but haven’t seen anything about tha. We had to hire someone because the ceiling has texture. 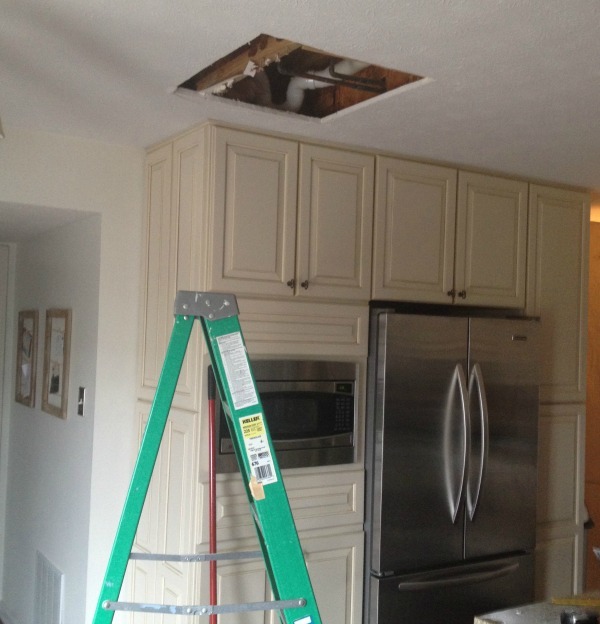 They had to re-texture our entire kitchen ceiling. We had to hire someone because of the texture.